Located roughly a mile north of the Beehive and Sand Beach, Champlain Mountain is the 6th tallest peak in Acadia National Park and the cliffs along its east face are some of the most impressive. The Precipice Trail is an ingenious route that heads up these steep cliffs, navigating the various fault lines and shelf systems. 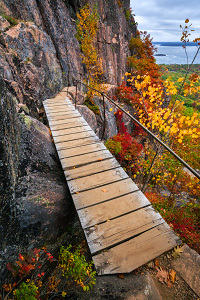 Numerous iron rungs, ladders, handrails, and wooden bridges help hikers at the more difficult and exposed sections. 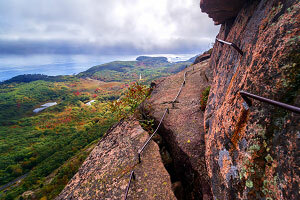 As such, this trail may seem more like a via ferrata climbing route than a simple hike. With a name like "Precipice Trail," you know this is the most difficult and exhilarating hike in the park! WARNING: This hike has numerous exposed climbing obstacles and is not suitable for small children or anybody who has a fear of heights or who isn't steady on their feet. Rating: Strenuous and exposed route with iron aides and scrambling obstacles. Access: Precipice Trail parking lot, roughly 2 miles down the one-way Park Loop Road from the Sieur de Monts Entrance. Elevation Change: 850-ft elevation gain up Precipice Trail. The Precipice Trail parking lot is located along the Park Loop Road, roughly 2 miles down from the Sieur de Monts Entrance. The lot usually fills during the busy summer months, but parking is also allowed along the road. The trail starts with a formal granite staircase and tourist-friendly sign, but quickly gets rugged as it heads west into the slopes under Champlain Mountain. Within a few moments, you will reach the "intimidator obstacle"--a boulder outcropping with two awkwardly-placed iron rungs. This is a test of sorts; if you have any trouble or fear climbing up this obstacle, it's time to turn around. After the initial obstacle, the trail continues northwest into the hills with a few iron rungs to help as handholds and footholds. The trail ascends and crosses over a massive boulder field (and even goes through a hole under a few boulders) and then follows a ledge system up the cliffs. Several sections may be intimidating, but the wavy iron railing is surprisingly helpful. After crossing a wooden bridge and following the ledges around the corner and up and down several sets of steps, you will reach the first trail junction. Turn left to take the Precipice Trail proper up the mountain. Here is where the real fun begins! The Precipice Trail starts a steady diagonal ascent along the forest base of a cliff band, requiring scrambling over several random boulder obstacles. Soon enough, you will reach the first long iron rung section with several ladders and handrails that go straight up the cliff band. The views start to get incredible as you walk the ledge above the first set of cliffs. Iron rungs can be found everywhere at this point the route zigzags up various faults and shelves in the cliffs. One of the more memorable obstacles is an iron rung ladder that goes up a flat square piece of granite with a sheer drop just to the right. Near the top is another set of rung ladders followed by a thrilling outward-leaning catwalk with handrails and also rungs on the ground to ease nerves. Soon enough, you will be standing on top of the precipitous cliffs and the final ascent to the summit is a simple uphill hike. From the summit of Champlain Mountain, enjoy the great views of the ocean to the east and Dorr Mountain to the west. 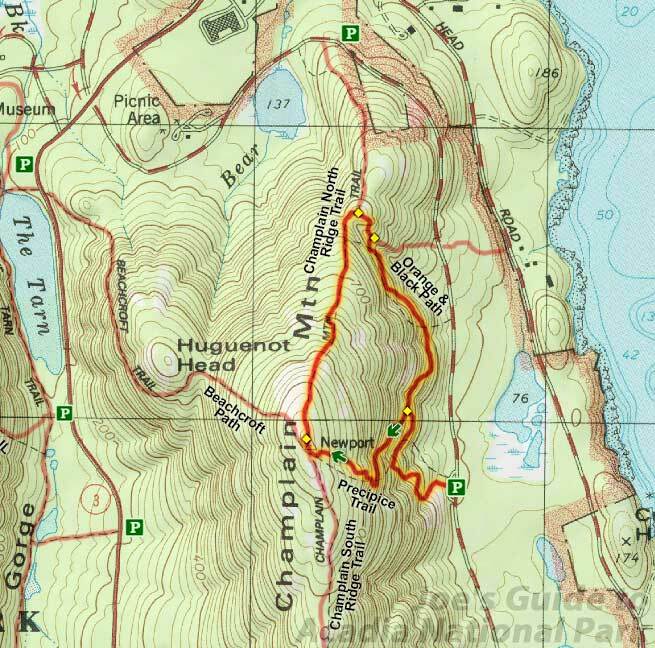 Although it is possible to descend the Precipice Trail, it is not recommended, so a simple loop hike down the Champlain North Ridge Trail (previously known as the Bear Brook Trail) to the Orange & Black Path (previously known as the Champlain East Face Trail) will return you to the Precipice Trail parking lot. Hiking down the Champlain North Ridge Trail is a breeze compared to the hike up Precipice, but the Orange & Black Path requires a fair amount of work as the trail goes up and down several sets of granite steps as it makes its way back south. Soon enough, you will be back at the junction with the start of the Precipice Trail, hiking familiar territory back to the parking lot. 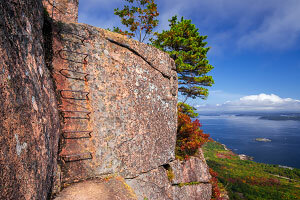 The Precipice Trail is the most thrilling and exposed hike in Acadia National Park and is reminiscent of European via ferrata routes. Although no climbing equipment is needed, this route needs to be taken seriously. If you have any doubts about the weather, time left in the day, or your ability to do this route, please play it safe. This hike is similar to the Beehive, but it is twice as long and is less forgiving. Hiking poles may be more of a nuisance than an aid since you will need your hands quite often.